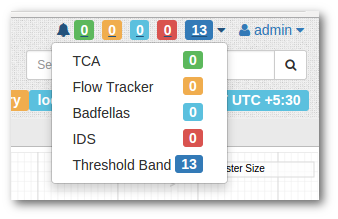 You can set up Trisul to generate alerts based on network activity. Trisul can generate 5 different types of alerts. Threshold bands are created for selected metrics based on past historical activity. Metrics are continously compared with expected values and alerts are generated if they fall out of bounds. Notifies you when ever any traffic meter crosses pre-configured hi and lo water marks. Alert on certain predefined flow activity. For example : Alert on flows that upload 20MB or more out of your network. There are many other types of flow activity that can be alerted upon as well. Trisul interfaces with Snort/Suricata using Unix Sockets. The alerts are correlated with other traffic metrics. Requires the Badfellas plugin. Trisul will continuously monitor your traffic and hold it up against millions of blacklisted entities. Any traffic that trips one of the blacklists, be it spam, phishing attacks, botnet C&C, is flagged. The Email and SMS services work by reading the SYSLOG alerts. So you need ensure SYSLOG alerting is enabled in trisulConfig.xml. It is enabled by default.